how to launch your Governor website on a custom domain. Governor sites can be launched on your own custom domain quickly and easily. Once you have purchased a domain from your favorite Domain Registrar (such as godaddy, network solutions, google domains, namecheap ) you are ready to configure your custom domain. The first step is to add DNS records wherever you domains DNS is managed. This is typically the same place your domain was purchased, but in some instances DNS may be managed on an external service. Once you have determined where your DNS servers can be configured you are ready to add DNS records for your Governor site. Governor supports three record types: A Records, CNAME Records, and ALIAS Records. Important Note: CNAME or ALIAS records are the preferred method for configuring your DNS records to work with Governor. CNAME and ALIAS records allow you to point your domain to governor server using our DNS hostname rather than an IP address. This is preferable A Records due to A records pointing to a specific IP address rather than another hostname. In the event that this IP may need to change due to unexpected future events, domains configured using A Records may need their DNS records updated. Not all domain/dns providers support CNAME/ALIAS records for the root/naked domain (i.e. website.com) so an A record may be required. Each DNS/Domain provider has a different interface for modifying the DNS settings of your domain name. For specific information on how to add these records to your DNS configuration, please consult the documentation available from your DNS/Domain provider. Once you know how to add and edit DNS records for your specific domains provider. Make sure the following records are configured. Once you have added the records to point your custom domains to Governor. You are ready to configure Governor Domain Settings within the app. Now that you have your DNS records ready, its time to configure your Governor Domain Settings. In the Domains Configuration area. Begin by entering your Primary Domain. Your Primary domain is the hostname that all other custom domains will resolve to. Note: Any other domains associated with your site listed in the custom domain list will be automatically redirected to this hostname with a 301 redirect. Once complete. 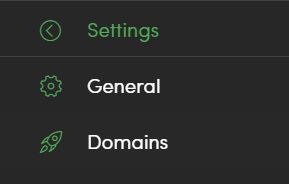 Save your Domain settings by clicking the green button located in the top right corner of the Domain Settings area. Thats it. Your Governor website is now configured to use your custom domain. Verify this by visiting the domains listed. Visiting the Primary domain should resolve your Governor website. Visiting any other domains located in the Custom Domain List should redirect to your primary domain. What if its not working? If you have followed the steps above and you are still unable to see your Governor website on its custom domain it may be due to DNS propagation times. DNS Record changes can take up to 48 hours to take effect depending on the DNS provider, and the settings used for the DNS record. For that reason it may take some time for the DNS records to fully propagate and start showing your website. If you think your DNS records have fully propagated but you still aren't seeing your Governor site. Please contact support and they can assist you in resolving any issues you experience.